I ran into a situation where i have to handle the session start of a SharePoint application. I dint find much information about it in the internet, so i decided to post one myself. There are two main steps for this. 2. Handle the Session_Start event. 3. Add the Session module for your SharePoint site from the IIS Manager. Open IIS Manager and expand sites. Select your site and double click on Modules. 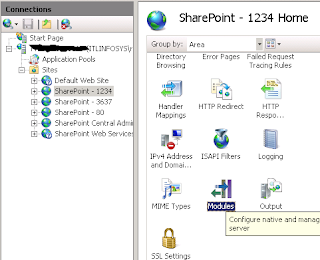 This will enable sessions for your SharePoint web application. Now you have to handle the Session_Start of your application. For this create a normal ASP.NET web application in Visual Studio. Add Global.asax and write your code in the Session_Start event. To make this Global.asax usable by your SharePoint application, you have to make one small change to it. Make the class of your Global.asax inherit from Microsoft.SharePoint.ApplicationRuntime.SPHttpApplication. Just replace the HttpApplication with Microsoft.SharePoint.ApplicationRuntime.SPHttpApplication. 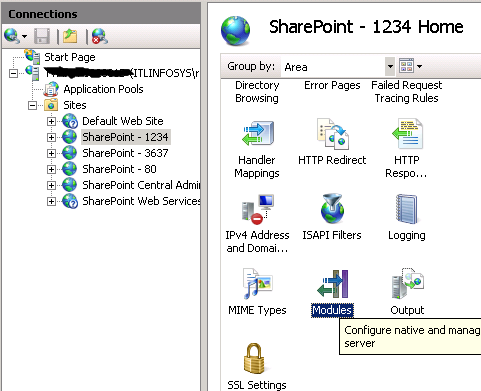 Go to the virtual directory of your SharePoint web application and do the following. 1. Replace the existing global.asax with the newly created file. 2. Copy the dll generated for your Visual Studio project and paste in the bin directory of your SharePoint web application.